Twenty years ago to the day, I was standing at 2030 Grand River, Detroit, in front of a metal door. A friend I was visiting in Troy had given me a lift to the city, to catch sight of the downtown before heading to techno’s sanctuary Submerge. Before that I made a stopover at Save The Vinyl record store, picking up Dan Lodig’s “Che Si”, Dance Mania’s “Basement Traxx Vol. 2” and X-103’s “Thera”. Had some talk with the guys in the store, asked for directions to Submerge and found the way quite easily afterwards. I’m not sure if I managed to make a phone appointment at Submerge, before ringing the doorbell. When inside, the wealth of records almost paralysed me and it was difficult to make my choice from the crates. 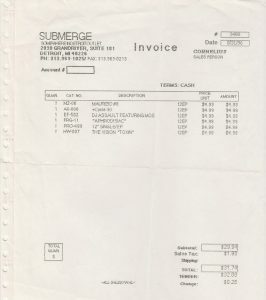 But there were no difficulties with the people at Submerge, Cornelius Harris aka The Unknown Writer and Bridgette Banks, who were extremely friendly and showed me around. At some point a fellow with baseball hat appeared and told his name is Mike. We shook hands and when chatting he presented me his street race car and asked to pin Tallinn on the world map that decorated his office wall. Because of the emotionally laden situation I managed to buy just a few records (see a capture below). 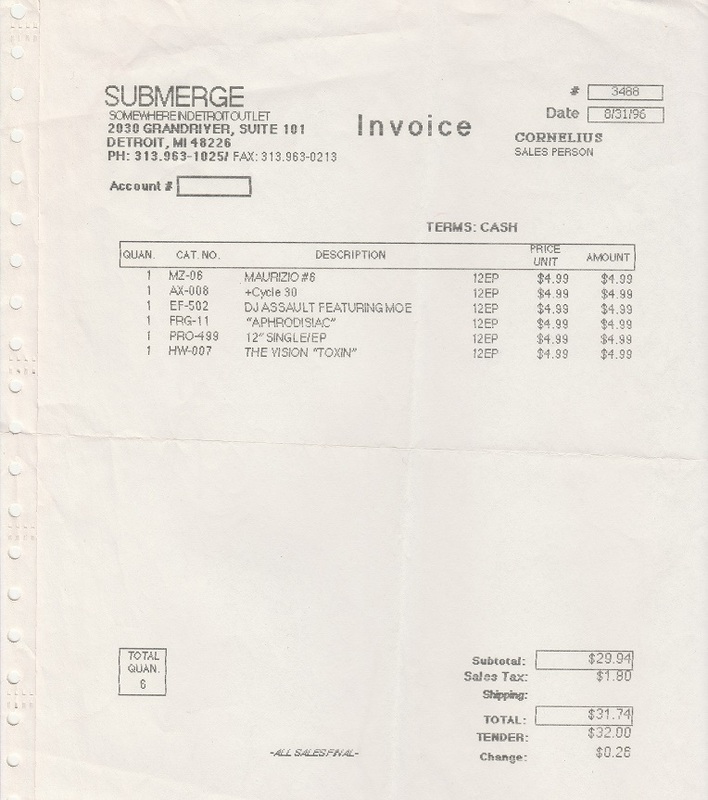 And I left with “Sweat Electric”, the inaugural release of the sought-after series “Somewhere In Detroit” that was available in Submerge store only. 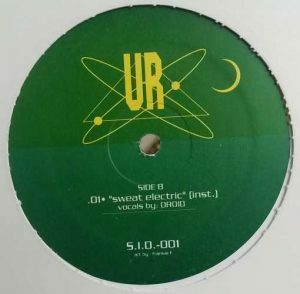 Probably released before the similarly sounding “Electronic Warfare” double pack, it stands for Mad Mike/UR blueprint electro that can be called timeless. “Sweat Electric” is an expression of electro’s strength and attitude in its purest form with booming bass and Droid’s robo voice showing the way to the interplanetary combat zone. My modest shopping bag at Submerge.